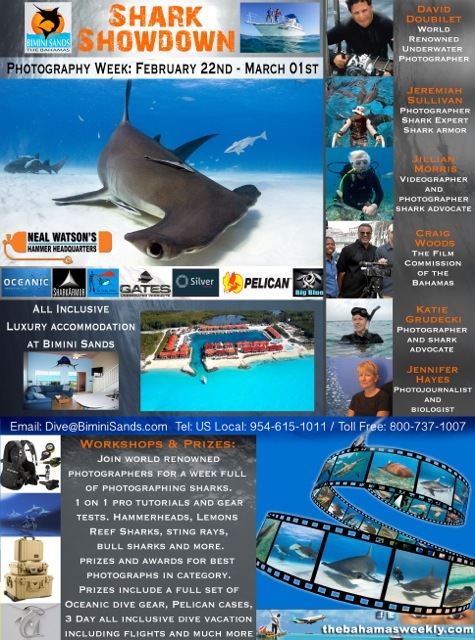 Shark Showdown Photo Week follows the inaugural Shark Showdown Film & Video week, which will take place at Bimini Sands on 1/25 - 2/1/14. Both events are scheduled to take place during the annual Great Hammerhead migration that makes Bimini one of the world’s top shark dive sites. Neal Watson’s Bimini Scuba Center, known as “Hammer Headquarters”, offers encounters with these majestic creatures lead by guides who developed the site and have over a decade of experience diving there. Part of the proceeds from each diver goes directly to local shark research and conservation efforts. Shark Showdown 2014 Photo Week’s all-inclusive adventure will feature unparalleled shark diving and photography, daily professional underwater photo workshops, one-on-one tutorials with the experts, encounters with wild dolphins and stingrays. Also included are all the participants’ meals & beverages, including the Welcome Dinner and Awards Banquet, water-view condo accommodations – with Neal Watson’s Bimini Scuba Center’s 40-foot custom dive boat at your doorstep. Participants will submit their Shark Showdown films or videos at the end of the week to compete for amazing prizes from Oceanic/Aeris, Pelican, Shark Armor, Pascale Painter of the Blue, and a Weekend Getaway with airfare and diving at Bimini Sands Resort & Marina. Bimini has been at the forefront of shark science and conservation for decades thanks to the world-renowned Bimini Biological Field Station (“Sharklab”), located near Bimini Sands. The island is known for the incredible diversity of its underwater species, but the two new Shark Showdown weeks will be Bimini’s biggest media events dedicated solely to sharks. Part of the proceeds from each Shark Showdown 2014 will go to local shark research and conservation efforts. Shark Showdown also welcomes special guest Jennifer Hayes, photojournalist and biologist. Shark Showdown 2014 Photo Week is supported by thebahamasweekly.com and other important sponsors. Space is limited to 12 divers, so be sure to book early before this incredible opportunity sells out. (Non-diving guests are also welcome.) For more information about Shark Showdown 2014, please call 1-800-737-1007 or 954-615-1011; email dive@biminisands.com, visit www.biminiscubacenter.com, www.biminisands.com, and Facebook.com/SharkShowdown. All-Inclusive Scuba Diving Packages with Neal Watson’s Bimini Scuba Center are also available this fall and winter at Bimini Sands. For more information, email dive@biminisands.com. Established by world record-holding diver, “Dive God” Neal Watson at the Bimini Sands Beach Club property on South Bimini, Bahamas, Neal Watson’s Bimini Scuba Center has gained a reputation for guiding spectacular yet safe, cage-free Great Hammerhead shark encounters around Bimini, earning the name “Neal Watson’s Hammer Headquarters”. Featuring a custom 40-foot dive boat and the only Nitrox fill station on Bimini, Neal Watson’s Bimini Scuba Center offers daily two-tank dives, underwater Big Animal Safaris, dive training and equipment rentals. For more information, visit www.biminiscubacenter or call 800-737-1007 or 854-615-1011. Located just 50 miles from Miami on the Bahamas gateway island of South Bimini, this year-round resort features luxury one- and two-plus-bedroom villas with beach or marina views; a full-service “Shark-Free” marina accommodating boats up to 115 feet; three freshwater swimming pools, including an Infinity Pool overlooking the Gulf Stream; upscale dining—along with the island’s only sushi bar—and a full suite of eco-adventure water-sports activities. Minutes from Bimini International Airport with service to the U.S. East Coast and Nassau, its idyllic location offers spectacular views of Bimini’s luminous blue waters, sunsets over the Gulf Stream, coral reefs and a secluded ocean beach just steps from your door. Family-owned and operated for more than 15 years, Bimini Sands Resort & Marina is one of the Bahamas’ best-rated family vacation destinations. For more information, visit www.biminisands.com and www.biminiscubacenter.com.